Why Do We Have Spinal Curves? It may not be what your mother told you, but the spine is not meant to be straight. Because of its position, the spine has to take pressure, weight, and force from structures that, by comparison, tend to be heavier and bulkier. An example is your pelvis, which is a large bone into which the spine wedges. And as if that weren't challenging enough, as part of its job, the spine must help keep your whole body balanced in both stillness and movement. These are modulated and accommodated by the curves of the spine. The spinal column is composed of 33 vertebrae. Most of the column sits on, and is therefore supported by, the "sacral base." The sacral base is the top surface of the sacrum bone, which is a triangular bone wedged in between your two hip bones in the back. The sacrum bone naturally angles forward a bit, setting the stage for spinal curves. Below the sacrum bone is your coccyx bone, aka the tailbone. 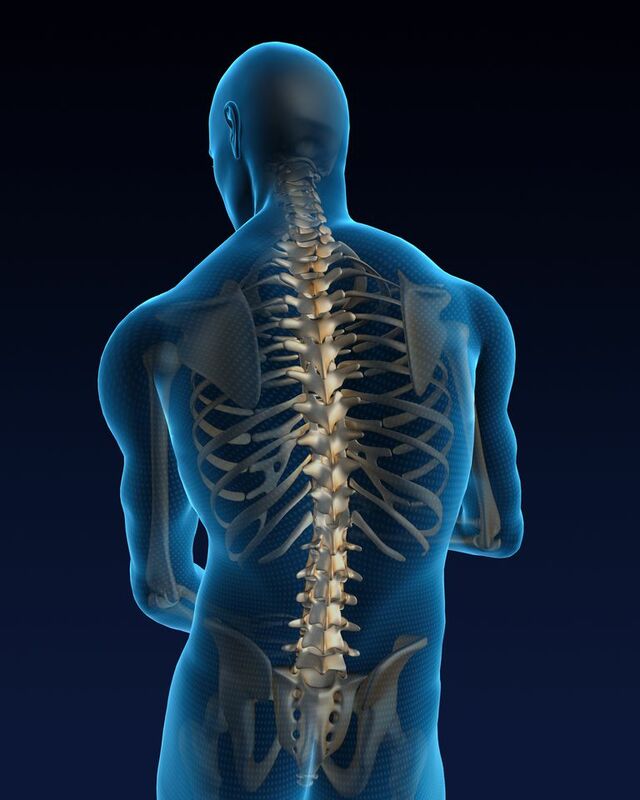 The spinal column houses the spinal cord, which is a key structure of the central nervous system. The spinal cord runs through a hollowing in the center of the stack of spinal bones (also known as vertebrae) that make up the spinal column. An upright position of the spine — as when you sit up or stand up — is technically called "posture" and/or "static spine". It is from this erect "posture" that anatomists make measurements and create references for determining what is normal and healthy about your alignment, and what needs work. These areas of the spinal column correspond to your spinal curves. Generally, only the cervical, thoracic and lumbar curves are talked about to any great extent, especially when the communication is given by doctors and physical therapists to non-medical people. Limiting the talk about spinal curves to the cervical, thoracic and lumbar is also a common practice in the media. Taken as a whole, the curves in an adult spine make an "S" shape when you look at the body from the side. From the side view, some of the curves go forward toward the front of your body and others go backward. The direction of each curve (i.e. forward or back) alternates from curve to curve; this alternation helps you maintain body posture as well as negotiate challenges to your balance. In fact, the curves are classified according to the direction into which they go when viewing the whole spine (body) from the side. The term that describes the neck and low back curves is lordosis. The term for the thoracic and sacral curves is kyphosis. (You've probably heard of kyphosis as a posture problem. But in reality, kyphosis is the general name for a type of curve, and when there's too much of it, regardless of the specific region in which it is located, the term becomes a label for a problem or medical diagnosis. The term lordosis is used in the same way. Called the primary curve, only the kyphotic curves (thoracic and sacral) are present when you are born, together forming one big C shape. The others develop as you acquire the ability to lift your head (cervical curve) and learn to walk (lumbar curve.) These are considered secondary curves because you develop them after you're born. The transition areas between the spinal curves are called junctions. For example, the cervicothoracic junction is the area between your 7th (and last) cervical vertebra and your 1st thoracic vertebra. The thoracolumbar junction is the area of transition between the thoracic spine and your lumbar spine. Because the junctions involve a change of direction between one curve and the next, they are sometimes more vulnerable to wear and tear and other types of injuries. As you can see, spinal curves are necessary and complicated. For this reason, it's best not to try for a straight spine, but rather look for ways to develop balance through all the joints of your body. This will likely help your spinal curves to assume the best position for good posture and a pain-free back. Calliet, R. Low Back Pain Syndrome. 5th ed. Pain Series. F.A. Davis. Philadelphia. Wang VY1, Chou D. The cervicothoracic junction. Neurosurg Clin N Am. April 2007.